For two thousand years, scholars and theologians have interpreted the Bible to suit their own ideological perspective, while the Bible categorically states in 2 Peter 1:20 that it is not for any private interpretation. In fact, it is just the opposite. The Word of God is a discerner of all things and is the absolute and final answer to every question (Hebr 4:14). The Bible is unequivocally and without any doubt whatsoever, the Word of God. In fact it is God and to change any part of it, through interpretation or discernment, would be to change the image of God. The viewpoints made by the author in this book are not based on any interpretation. For this reason, anyone (including scholars and theologians), would have a difficult time arguing any of the viewpoints in this book. To those that believe in the true and living God, this book will be a confirmation how deception has entered into the world, while to the unbelievers, it will be merely a stumbling block — as will be all of the Scriptures (1 Cor 1:23; 1 Peter 2:7-8). On the back cover of the book, there are a number of questions the book will answer. Another commonly asked question is "What church do the believers in God belong to?" The answer to that question is that the true church is not of this world (John 7:7; Rom 12:2; Gal 4:4; Eph 2:2; 1 John 2:15,4:5). The Bible teaches that there are two spirits at work in a person's life and in this world. It further teaches that a person is separated from God and for this very reason every person has to repent and change from darkness to light and from the power of Satan unto God, if they wish to live in union with God (Acts 26:16-18). The wisdom in this book is not of this world (1 Cor 2:4-8). It takes a step-by-step approach and shows the reader how this whole world has been deceived. It further shows what has gone wrong with creation and what God's plan is for His everlasting Kingdom. It explains (as does the Bible), that God's Spirit is greater than he that is in the world (1 John 4:4-6). It further explains that through repentance (changing of spirits) every person can overcome the spirit of this world (1 John 5:4). 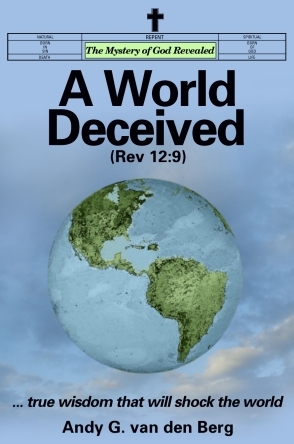 A World Deceived is not like any other book and many may find it even rather controversial. It may also confound the many people that have an opportunity to study it (1 Cor 1:27, 1 Peter 2:6). However, the main purpose of this book is to give readers a better understanding of past and current world events and to assist people in their search for the Kingdom of God. This website was launched in 2005 with a limited amount of content. As inspired by the Spirit of God that gave us understanding (Job 32:8; 2 Timothy 3:16), we wrote and added new Articles and entries to the Current Events page. In 2017 we wrote a Letter of Introduction that is emailed to all those that contact our Ministry in Christ. The following is a copy. We launched our website in 2005 to compliment our book 'A World Deceived'. It has been the number one Listing on Google out of millions of results, using the entries 'a world deceived' or 'world deceived', along with a number of our articles. In 2018 the website was visited by people from approximately 160 countries. We have ministered to the people of this world for more than thirty four years and there are those that will attest that our message of Repentance is according to the Spirit of truth (John 14:17); whom the world cannot receive, because it seeth him not, neither knoweth him (John 14:17). It should be noted that in over 34 years of service we have never collected/received, solicited or requested donations. The gift of 'Life' was freely given and freely do we give to all those that believe (Matthew 6:26; 10:8). As the successors of the Apostles, we are the sure and authentic amanuensis (relating to) of the Holy Spirit; and therefore our writings are to be regarded as the oracles of God (Psalm 28:2; Romans 3:2). As John the Baptist was called to prepare the way of the Lord Jesus Christ (Isaiah 40:3; Malachi 4:5; Luke 1:17) and to preach the Baptism of Repentance (Mark 1:4; Luke 3:3), so have we been called to prepare the people of this world for the return of our Lord and Saviour Jesus Christ and the beginning of the one thousand year reign of His Kingdom (Luke 14:15; Thess. 4:16; Rev. 19:9; 20:2,3). Gal. 1:11,12. The gospel which was preached of me is not after man. For I neither received it of man, neither was I taught it, but by the revelation of Jesus Christ. It is our hope that all mankind come unto the knowledge of the truth (1 Timothy 2:4) and we would appreciate it if you forward this email to your family and friends and bring as many people to our website as you possibly can. We thank you in advance for your effort. The purpose of our website is to show mankind how and by whom they have been deceived as confirmed in Revelation 12:9. Entropy: A process of degeneration with increasing certainty, chaos, etc., specifically, when regarded as the final stage of a social system (Religions, Political Systems, Medical Profession, Judicial Systems, Media Industry, the Environment, Sports and Entertainment, etc.). For those that are not familiar with the Book of Revelation of the Word of God, it should be noted that most of it describes the events during the time-frame of the latter days, which are the days since God dwelt in the earth in the name of Jesus Christ two thousand years ago. Most events described in the Book of Revelation have already taken place, but other events still have to take place before the great and dreadful day of the Lord (Luke 21:20-28; Joel 2:31; Malachi 4:5). Don’t concern yourself with the events that are still to take place or the times when they will occur. God is longsuffering and the only message that is important is our message of Repentance (Mark 1:5; 6:12; Luke 13:3,5), and we invite you to study what that means, so that you may be able to hear and understand our communication (John 8:43-45). The Word of God records in Revelation 12:9 that this whole world has been deceived, and the content of our website is to show how and by whom the people have been deceived, and what mankind must do to be reunited with the only true and living God.